Maureen Stapleton, the longtime leader of the San Diego County Water Authority, helped the region secure its own supplies of water. But amid a water war she helped launch and the bitter, personal disputes it’s set off, it’s now an open question whether Stapleton will be able to end her career on a good note. 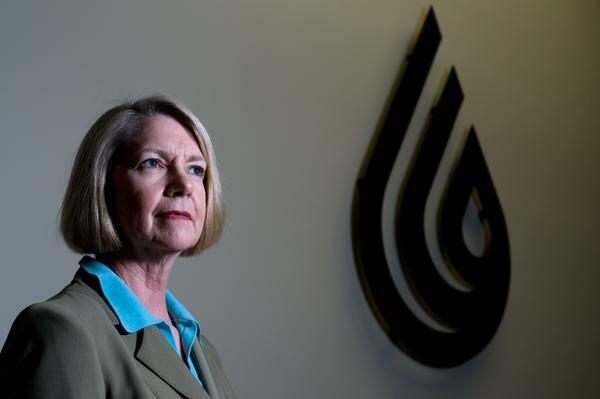 For 22 years, Maureen Stapleton has led the San Diego County Water Authority. In just two decades, the agency’s first female general manager accomplished what generations of men had not: Under her leadership, San Diego acquired its own supplies of water. Now, though, amid a water war her work has inflamed, she is accused of leading the agency into the gutter. In May, one of the Water Authority’s board members said an intoxicated Stapleton came up to him at an industry event and accused him of sleeping with an employee at a rival water agency. There’s no evidence such an affair happened. An investigation of Stapleton’s behavior is ongoing. Several other people have since come forward to say that incident wasn’t the first time the Water Authority has become bitter and personal under Stapleton’s leadership. However she is remembered, the string of water projects Stapleton worked on – from a new desalination plant to new dams – will be affixed to San Diego’s landscape and economy for decades to come. In the mid-1990s, Stapleton was an assistant city manager in San Diego. She had a good shot at becoming city manager, then the most powerful position in city government. At the same time, the Water Authority was looking for a new leader and a new direction. A drought in 1991 had left the whole region reeling. For years, the Water Authority had been a sleepy little agency, created as a middleman between the Metropolitan Water District of Southern California and local water agencies in San Diego. Metropolitan gathers water from the Colorado River and the rivers of Northern California and resells it across Southern California. The Water Authority would buy water from Metropolitan and resell it to smaller agencies in San Diego, like city water departments. But when the early-1990s drought came, there wasn’t enough Metropolitan water to go around. San Diego was on the brink of being forced to cut its water use in half, a move that could devastate farmers, businesses and risk the entire region’s way of life. When business leaders realized 95 percent of San Diego’s water came from one agency that San Diegans didn’t control, they were shocked. “If that were your investment portfolio, you would shoot your investment portfolio adviser,” said Tom Wornham, a banker who served as chairman of the Water Authority’s board. Stapleton was brought in to help change things. Mark Watton, the chairman of the Water Authority board who hired Stapleton, had already begun entertaining offers to buy water from Imperial County. Imperial has just 5 percent of San Diego County’s population but has rights to more Colorado River water than anybody else. Almost all of that water goes to farming. For years, California had also been using Colorado River water that belonged to Arizona. That had to stop, but California water agencies disagreed about how to share less water. By putting money on the table, the Water Authority made it easier for Imperial to agree to limit its use. Eventually, some 30 different agreements had to be signed among water agencies and the federal government. Those agreements were key to preparing the river, which 40 million people depend on, for drought. Stapleton is among the officials credited with helping keep that process on track. In the middle of those negotiations, Jack McGrory, the departing San Diego city manager, called Stapleton to see if she wanted to quit water and manage the city. “I tried to encourage her to come back and compete for that job, but she decided to stay with the Water Authority,” he said. The choice seemed to have paid off. By the end of negotiations in 2003, the Water Authority had signed long-term deals to get enough water to serve over 2 million people – water earmarked for San Diego alone. While most of the San Diego establishment favors the deal with Imperial, it has come at a cost. Not only is the water more expensive, but the political machinations necessary to secure the water set off a war between the Water Authority and Metropolitan. A few dissenters within San Diego have even said dealing on its own with Imperial is among the biggest mistakes the Water Authority ever made. Metropolitan had the chance to buy some of Imperial’s water, but passed. Metropolitan officials argue that was strategic – the farmers would have to come back later with a better offer. Metropolitan owns the only aqueduct to bring water into urban Southern California from the Colorado River. The farmers might have been boxed in – if all the other Southern California water agencies had refused to negotiate. Instead, the Water Authority broke ranks and negotiated its own deal, seizing on a chance to get water that it could call its own. On top of the high price it paid for Imperial’s water, the Water Authority also agreed to pay Metropolitan a fee to transport that water to San Diego. Fighting over that fee continues to this day, though the courts have said Metropolitan’s price is, by and large, fair. For a while, though, part of the Water Authority’s board agreed the Imperial deal didn’t make sense and went into full-on rebellion. If Metropolitan got a good deal for the water, it would then share that water with San Diego. By buying the water itself, the Water Authority might have been driving up the price. “To me it never made sense for the Water Authority to essentially go out and negotiate against itself,” said Byron Buck, a former Water Authority staffer. Shortly after Stapleton started, Gregory Quist, a Water Authority board member from the Rincon del Diablo Municipal Water District in Escondido, produced a pamphlet about the deal called “But Who Will Pay? A Faerie Tale.” In it, a desperate village knight (the Water Authority) is seduced by a sage businessman (Imperial farmers). As a result, the villagers (San Diego water customers) end up paying too much for water. Water Authority board members who represented farmers led a walkout to protest the deal with Imperial. Years later, Quist stands by his take on the deal. Though a variety of factors are involved, the farmers’ fears were largely correct. In the years since the Imperial deal, soaring water rates have driven San Diego farmers out of business. Pat Mulroy, the former head of the Southern Nevada Water Authority, remembers interviewing for the Water Authority job in the mid-1990s that eventually went to Stapleton. Now retired after a career as one of the most powerful players in western water, Mulroy does consulting work for Metropolitan on Colorado River issues. When the Water Authority job opened up, Mulroy had also been at odds with Metropolitan, so she was an obvious candidate to lead the Water Authority. But her assessment was the Water Authority wanted a “hit person” to wage war on Metropolitan, so she took herself out of the running. “I was taken aback by what they were looking for, because I had a different vision of what a general manager should be,” Mulroy said. The question now facing Stapleton and the Water Authority is just how hard the agency has been hitting. In 1995, Annette Hubbell took a job working as Metropolitan’s liaison in San Diego. That meant trying to get the Water Authority to see eye to eye with Metropolitan – a close to impossible job then and now. Not long after she started, Hubbell received a call at home. As Hubbell recalls, a woman on the other end asked to speak with her husband. The woman then accused Hubbell of having an affair with someone else within the water industry. Hubbell says she did not have such an affair and that her husband did not believe the allegations either. “I was certain it was someone from the Water Authority,” she said. It’s not clear if the call came before or after Stapleton started as general manager in January 1996, but over two decades later, Hubbell decided to talk about the call because of what happened to Meena Westford, a former Water Authority employee who now has Hubbell’s old job at Metropolitan. Stapleton spread rumors about Westford, according to a letter calling for an investigation into Stapleton’s conduct written by Tom Kennedy, a Water Authority board member from the Rainbow Municipal Water District in Fallbrook. At a water industry event in May, an intoxicated Stapleton took out her phone to pull up a salacious website, Kennedy wrote. The site allows people to anonymously post unconfirmed allegations of adultery. A post about Westford was on the site. According to Kennedy’s account, Stapleton also suggested Kennedy was having an affair with Westford. Kennedy and Westford both deny an affair took place, and no evidence has surfaced to show it did. Mark Hattam, the Water Authority’s general counsel, said the agency had no knowledge of Hubbell’s claims, which are from a quarter century ago. Metropolitan, the Water Authority and their allies have a history of being at one another’s throats. Most famously, to try to stop the deal between the Water Authority and Imperial, Metropolitan and its allies launched an ethically questionable public relations campaign. The centerpiece was a report that looked into potential conflicts of interests on all sides of the deal. Some of the potential conflicts were absurd – the report noted, for instance, that some major Imperial landowners and a Water Authority board member both owned stocks in Disney. Because the research also targeted members of the state Legislature, lawmakers were quick to punish Metropolitan. In 1999, they made Metropolitan create an ethics office to try to police itself. But in recent years, the Water Authority has tried its own envelope-pushing tactics. Last year, for instance, the Water Authority paid for a political-style poll designed to test the public’s response to negative information about Metropolitan. Andrew Poat, a longtime aide to Gov. Pete Wilson who now does public affairs work, was hired a few years ago to do outreach for the twin tunnels project, which is Gov. Jerry Brown’s attempt to improve the flow of water from Northern California to Southern California. The Water Authority has been a leading critic of the project. Once Poat started, he said he began hearing about rumors that he was working for Metropolitan, which is akin to a scarlet letter for San Diego consultants. He said that becomes dangerous for a public agency when other voices are not considered authentic or properly motivated if they disagree. “I used to be one of the [Water Authority] apostles, now I read every piece of information and then I wonder if that information is as complete as I once thought,” he said. Hattam said the Water Authority did not start rumors about Poat. The Water Authority has also gone to questionable lengths to get information. In 2014, a Water Authority staffer called into a conference call that the agency was not invited to, without announcing her presence on the call, as others had. The conference call was intended for water agencies that would be asked to pay directly for the tunnels project; San Diego will pay indirectly, so it wasn’t included. Later, records released by the Water Authority in response to a public records request from a pro-tunnels attorney showed that the Water Authority had been sharing information about the calls with an anti-tunnels group. The Water Authority declined to make Stapleton available for comment but offered up a host of San Diego leaders to vouch for her. Rep. Scott Peters, a former city councilman, said he’s not sure anyone else could have helped San Diego get the new water supplies it has now. “People are not interchangeable, she’s had a lot of success, there’s been a lot of progress on diversifying water supply here,” he said. Julie Meier Wright, the former head of the San Diego Regional Economic Development Corporation, highlighted Stapleton’s “can-do” attitude. “She was able to attract talented, busy executives and I think that is because of who she is,” she said. Water Authority board members, for their part, seem to like her. Both Mel Katz, a new board member, and Mark Weston, a former board chairman, said during her recent performance review that Stapleton’s got high marks from board members. She is paid over $300,000 a year. Few people shed much light on the woman herself. “I think she only works,” said Watton, the chairman of the Water Authority board when Stapleton was hired. Wornham, another former chairman, said after the Water Authority approved the deal to help build a desalination plant to make ocean water drinkable, he urged Stapleton to take credit during a press conference, even though she was trying to stand off to the side. The plant can provide about a tenth of the region’s water – another major new supply of water added under Stapleton’s watch. Stapleton is married to Frank Gehrke, the chief of snow surveys for the state Department of Water Resources. Many people may remember him from a series of famous photographs taken in 2015, when he and Gov. Jerry Brown stood in a snowless meadow and the governor ordered emergency water cutbacks across the state. In 2010, when things were a bit snowier, Stapleton helped Gehrke with his work. Photographs of the event show the couple trouncing around in the snow and working together to measure its depth with a series of unwieldy instruments. It’s now an open question whether Stapleton will be able to end her years at the Water Authority on a good note. Last year, the Water Authority largely lost a long-running lawsuit against Metropolitan. The Water Authority had argued the fees Metropolitan was charging to deliver the Imperial water to San Diego were unfair and illegal. It won a few hundred million dollars. But it lost the main argument, which amounts to about $6 billion over the life of the deal. But the loss didn’t affect the Water Authority’s interest in continuing to buy Imperial’s water, even though it had the chance to exit the 75-year deal early, in 2037. Instead, after about only two hours of public discussions throughout the course of 2017, the Water Authority voted in December to keep going with the deal. Indeed, at the meeting where the deal was extended, Stapleton spoke about it publicly for only 10 minutes, even though the decision will cost ratepayers a billion dollars or more. Dennis Cushman, the Water Authority’s assistant general manager, said there were more discussions held behind closed doors, because of legal issues involved. In a sign of how much things have changed under Stapleton’s tenure, extending the deal was taken as a given. One of the most controversial water deals in decades was extended without any public controversy. Metropolitan, whose allies had swung into action to try to stop the Imperial deal two decades ago, barely lifted a finger. Nobody testified for or against the plan, and only one question was asked by a Water Authority board member. Then, the agency’s board members voted unanimously to support the deal and went home for the holidays.